Your audience continues their journey with you through your sales team. 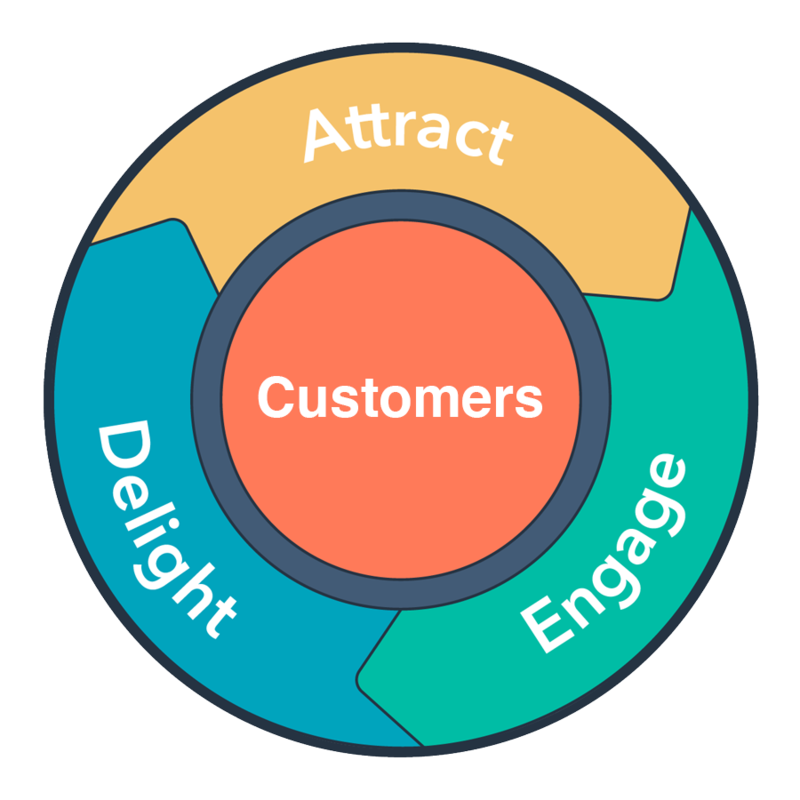 And inbound sales is your best approach to deepening your company’s relationship with your audience. In the earlier stage of inbound sales, you need to establish trust. This is one of your biggest obstacles because educated buyers are often skeptical of salespeople. But this isn’t outbound sales – you’re not cold calling or delivering elevator pitches right away. Through inbound sales, we help you connect and converse with prospects in a human way and attract new leads using various methods, like prospecting and using meeting scheduling software. This delivers a prospect-centric sales experience, so they can make decisions on their timeline. Inbound sales thrives when you can keep in touch and stay top of mind with leads. If you’re not consistently engaging with prospects, delivering valuable information throughout the prospect’s journey, you might be forgotten. We guide your sales team through all inbound sales best practices and help them use vital tools, like creating contextual email sequences, playbooks, and workflows. We also help you set up sales automation to ensure you deliver a positive experience in an efficient way. Your customers ultimately want to come to the conclusion that you can deliver the right solutions for them that fit their unique needs. You don’t win them over with outdated, aggressive sales tactics. You close deals by showing prospects how your solution helps them achieve their goals. We empower your sales team with insights and advice through impactful coaching sessions. We also help them make the most of sales tools, like conversation routing, to ensure consistent experiences that make prospects and customers feel supported, educated, and valued. Your team is only as good as the information you provide them. This is where sales enablement comes in. Our team helps with HubSpot installations, setups for tools like meeting scheduling and messaging, funnel analysis, reporting for each aspect of your sales process, and setting up your reporting dashboards. We also ensure your sales content is effective, creating sales documents, developing sequences and email templates, and training sales teams on how to use document tools in your CRM. Smarketing is more than just a trendy buzzword; it’s a necessity in today’s digital world. We help break down silos that are preventing business growth by establishing alignment processes, like lead scoring, prospect fit matrixes, and SLAs. Our team also supports your sales and marketing teams by assessing and recommending sales content, establishing lead handoff procedures, and creating and reporting on content feedback channels. Your CRM is the backbone of your sales department. Our experts educate and support your team at every step of the way, from initial setup and custom integrations to ongoing CRM administration, deal stage evaluations and criteria setting, and data cleansing. The best way to get sales team members up to speed with the inbound methodology is through one-on-one coaching. We provide coaching services at all levels – reps, managers, and VPs/directors – and assist at every stage of the rep lifecycle. This includes sourcing sales rep candidates, interviewing and hiring, onboarding, and conducting exit interviews. I have loved working with Bluleadz, they have done everything for us from the top down. From helping to redesign our website and making sure it is optimized to helping us put together a clear plan of attack not only for our marketing but also our social media presence, They are a wonderful resource and the service they offer is outstanding. Bluleadz has been amazing to work with. They support and assist us in all aspects of our marketing. I would highly recommend them. You aren’t currently utilizing a CRM and need guidance on the best one to choose. Or maybe you do use a CRM, but it’s old, ineffective, and your contacts and data are unorganized. You have no set sales process and no visibility into the health of your sales funnel because of it. Or, you have a basic sales process but it hasn’t been updated or revisited in a while. You don’t have any content assets that your sales team can use to increase value and brand trust with prospects. Or, you have some content assets your sales team uses but they haven’t proven effective and could use visual enhancement. You haven’t identified or mapped out criteria that distinguishes your various lead stages leaving your sales team uncertain on which leads to prioritize. Or, perhaps you have an idea of your good fit vs. bad fit opportunities, but haven’t built it out in a detailed manner that’s easy for your team to reference. Sales enablement services start at $2k/mo and includes ongoing sales support and training. We Don’t Have a Well Defined Sales Process, Can You Help With That? Yes, identifying all key stages of your sales process and mapping those to a sales content strategy is something our team has vast experience with. Why is “Inbound” Sales Important? The same way buyers have evolved to expect personalization from your marketing, they also expect the same valuable, informative journey once they convert into an SQL (Sales Qualified Lead) and enter your sales process. If that journey is inconsistent with what they’ve experienced thus far, you’ll continuously lose sales-ready leads. To learn more, Click Here. Can Inbound Sales Help us Close More Business? Yes, modern sales strategies and sales teams that directly support inbound marketing initiatives always have a higher lead-to-customer percentage, shortened sales cycles and more efficiently align buyer & seller expectations. To learn more, click here. Can Your Team Call/Work Our Leads for Us? No, our inbound marketing efforts will notably increase the amount of sales qualified leads you obtain over time and we can build targeted sales strategies to set your sales team up for success in this area, but we cannot directly work your leads for you. Do You Work With Our Sales Team as Well as Marketing? Yes, in a multitude of ways. Working with our customer’s sales teams is essential to maximize the ROI of inbound marketing efforts. Would You Recommend Adding Inbound Sales Services to Our Inbound Marketing? It depends on the current state of your sales department. If you have no sales process(es) in place, no existing sales content assets, no consistent CRM operation, and you’re still cold-calling leads, then you should absolutely consider these services. If you have some of the above in place, it may just be a matter of needing some refinement.